There is one feature of macroeconomic theory that amazes me more than any other: the multiplier. Not its existence per se - that is as logical as it is indisputable - but the fact that there are high-flying economists who passionately deny its existence. What is even worse is that they travel the world and dispense policy advice to legislators based on their very denial. Since Austrian economics attracts a great deal of libertarians and conservatives, you would expect them to also be quick to pick up on the causal relationships between the welfare state and perennial deficits in welfare-state government budgets. Yet for most of them that is not the case: instead, they blame government debt on "cartel banking" and fiat money. To the extent that they do understand it, their policy advice is misguided because of their failure to recognize the multiplier. Free of the structural constraints on borrowing established by risk assessments in a free market, the total state can pile up debt without limit through appeals to the newly created money of its central bank. The new dollars, again, are not simply transferred to the growing state in the blatant act of adding them to the treasury, but are shifted to benefit government by the Federal Reserve's "open market" policy. It is through this policy — whereby the supposedly "independent" Fed enters the financial market as buyer — that the debt obligations of the state are purchased (largely from investment banks) in order to underwrite an increasingly pervasive state. There is an implicit premise behind this reasoning, namely that modern central banking and fractional-reserve commercial banking came about first, and then the welfare state. It can be argued in absurdum which of these two came first; by relying on this implicit premise, the Austrian theorist can make the assumption that our modern monetary and financial system enabled the welfare state. a market freed from the state's needless regulations and its cancerous central bank, a market that would not forcibly prevent rational responses to economic signals. That alternative is the only real solution to the debt problem. 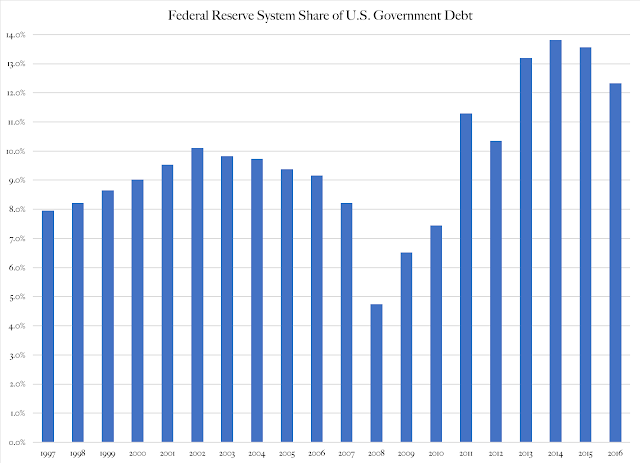 Before we broaden our perspective back to the egalitarian project known as the welfare state, it is worth noting that only a small part of current U.S. government debt is owned by the Federal Reserve. As of 2016, the Federal Reserve system owned just shy of $2.5 trillion worth of U.S. Treasuries, which was 12.3 percent of total federal government debt. With the Federal Reserve making only marginal contributions to government debt, common sense suggests we go look for another driver of Congressional over-spending: the welfare state. That, in turn, brings us back to the multiplier. First pinpointed systematically by R F Kahn in 1931 in an article for the Economic Journal titled The Relation of Home Investment to Unemployment, the multiplier proved to be a revolutionary tool in economic analysis. Kahn narrowed down a macroeconomic relationship that economists of his time had been only paying scant attention to, and then as part of their attempts at defining the term "effective demand". That pursuit, as Keynes put it in the General Theory, had only taken place "furtively, under the surface, in the underworlds of Silvio Gesell, Karl Marx and Major Douglas." Keynes took Kahn's work to heart, fused it with his own research in monetary economics and microeconomics (see his eminent Treatise on Probability) and developed a systematic foundation of macroeconomics. At the heart of that system are two dynamic relationships between economic activities: the multiplier and the accelerator. The accelerator, first, is the increase in economic activity that follows a boost in gross fixed capital formation - better known as business investment. The multiplier is the increase in economic activity that follows an initial rise in current spending, i.e., consumption, which can be either private or public. Theory distinguishes between the two primarily because investment is an expansion of economic capacity to provide for growth in consumption, while consumption is an expansion of the satisfaction of needs within existing capacity. In practice, the multiplier is the essential mechanism. Expansion of productive capital - the definition of business investment - is of no use if there is no reason for businesses to expect to get their money back on their investments. Expectations of profit are separated from expectations of loss by effective demand, a term we will have to explore in greater detail at a later point. What matters here is that a multiplier effect is needed before the accelerator can go to work. Put simply, yet accurately, the multiplier augments an initial increase in spending in one sector of the economy by the spreading of gains of trade in that sector. When, for example, people buy more cars, people who work in the car industry make more money, which they then spend in their local communities. People who make more money in those local communities also increase their spending, which in turn leads to yet more spending increases. Normally, multiplier effects wane away when they spread themselves thin enough. There is, however, a difference between multiplier effects in the private sector and those that are initiated by government spending. The bigger government gets, the more substantial the multiplier effects are, that it causes as it raises and lowers spending and taxes. Government policies are longer term in nature than private consumption, not in the sense of existence, but in the sense of decision making. This is just the nature of fiscally related legislation. As a result, however, drastic changes to government spending have drastic effects on the economy. We have seen this in countries that have been subjected to episodes of harsh austerity measures: the most common character trait is a deep and fast plunge in macroeconomic activity with a shockwave-style impact on the economy. This has certainly been the case in Greece during the Great Recession, but it was also the case in Spain and other countries during that same period of time. The shockwave-style decline in macroeconomic activity is, plain and simple, the multiplier at work. It is stronger and more destructive when negative than positive, and larger for some government policies than it is for the private sector. The reason for this is simple: some government policies, like changes to income taxes, affect us all immediately and simultaneously. While statists focus on the positive side of the larger government multiplier, Austrian theorists should focus on its negative side. There are two reasons for this. First, the larger and more destabilizing negative government multiplier is yet another reason not to have a big government. It is simply not good for the economy when one institution - government - can hurl it from prosperity to poverty in a matter of a couple of years, just by a concerted effort of austerity. It is much better for macroeconomic stability to privatize the welfare state, eliminate economic redistribution as a policy goal and return government to its minimal duties. Secondly, a strong, rapid negative multiplier quickly opens up big deficits in government budgets. Plummeting macroeconomic activity leads to plummeting tax revenue, while welfare-state spending accelerates due to the design of entitlements in a modern welfare state. When the multiplier pulls the two parts of the government budget in different directions, the result is an exploding deficit. 1. The root cause of our big government debt is not the Federal Reserve, nor is it fractional banking. Those are just institutional consequences of the complexity of a modern monetary economy. 2. Our government debt originates in structural over-spending, which in turn is caused by a massive system of entitlements. The cost of those entitlements are driven not by our financial system, but by the terms of eligibility that our legislators have attached to each and every entitlement program. 3. If we had no welfare state, we would have no chronic deficit in our federal government budget. I wish the Austrian economics community would come around, abandon its obsession with the Federal Reserve and join in the fight against the egalitarian takeover of the Western world. Once the United States is engulfed in a Scandinavian welfare state (and it is already deep in) the era of free-market capitalism will slowly but inevitably grind to a halt. Needless to say, understanding Keynesian economics is the only way to full insight into the systemic problems facing our modern, Western world. I will keep praying for all you fans of Murray Rothbard and Ludwig von Mises. *) For in-depth analysis of the relationship between the welfare state and government debt, please see my 2014 book Industrial Poverty, my 2016 article in Journal of Governance and Regulation: Balancing the Budget: Can the Swiss Debt Brake End Endless U.S. Deficits? and my latest book The Rise of Big Government.